When you're looking for the best in The Villages helicopter lift services, there's no need to turn to any other broker than FairLifts. You get access to a wide range of service providers in our network at your disposal that provide quick, efficient and professional services unlike any other. Time is of the essence when you have an important delivery to make or need to make use of heavy lift applications or deliver supplies and work crews. There's truly no better means than helicopter. What’s the first thing that comes to mind when you think of any city in Florida? Sunny beaches, pleasant subtropical weather, paradise? Absolutely! When you’ve done your part in making America great again for half a century, you’re sure to want to sit down for a cold one and enjoy the fruits of your labor. There’s no better location to do so than in The Villages. Why not top off the experience of a lifetime with one of the fastest means of transportation around? With FairLifts, we provide access to a network of incredible service providers willing to travel at a moment's notice guaranteed. No need to wonder if a shipment can be made or if you’ll be able to catch a ride to an important business meeting at the airport on time.Time is of the essence and things need to get done. Call FairLifts today for a quote on helicopter services available to you! Through FairLifts, the extensive helicopter lift services network is among the best in the nation. With access to the largest assortment of helicopter specialists to aid you in heavy lifts, emergency delivery and logistical transport, it's no wonder that FairLifts reserves the best helicopter solutions in the central Florida area! Got a construction project that needs completion? When you book through FairLifts, you have your choice of a wide array of helicopter lift solutions to aid you in various building, preparation, tear down and clean up situations for your site. While traditional cranes can do some of the same, they are limited in their scope and reach, helicopter's are virtually limitless to the potential of possibilities. When the job requires the movement of a heavy load, rest assured that when electing service providers with heavy lift capabilities, no tree, I-Beam or scaffold is unattainable for a helicopter. Specially designed helicopters are used for projects like this where the lift and transport of heavy equipment is paramount to mission success. Many times during cargo delivery, whether by land, sea or air, there are often requests to get certain parcels to their destination before the rest of the load. 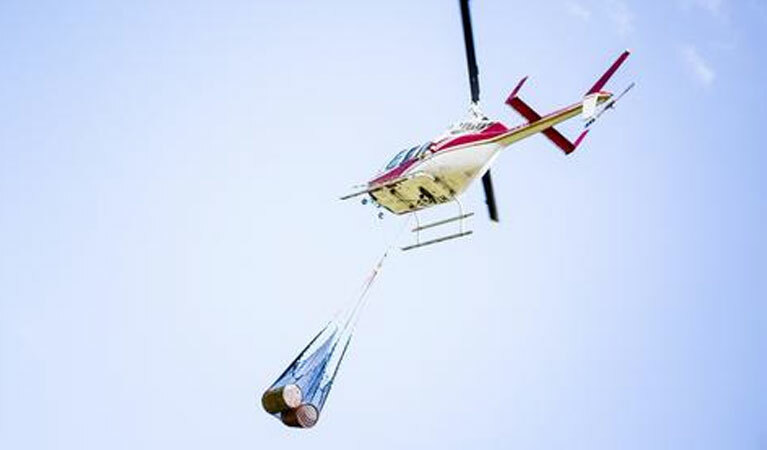 Helicopters can carry massive cargo to deliver to offshore oil rigs, water vessels, cargo holds and ports to allow for swift delivery for time-sensitive deadlines. The race against time during a medical emergency or expedited delivery of medical goods is paramount to not only mission completion, but also in saving lives. When booking through FairLifts, we provide an ample network of service operators in the area to provide aid regardless of weather or time constraints. When the safety and recovery of a life is important, rest assured we give you access to the right service providers at the right time. When you’re ready for optimal airlift service providers to provide the finest and best, be sure to contact the best booking agency to get the job done. Contact FairLifts today for a free quote on airlift services through our customer support by filling out the form below or give us a call and we’ll respond to your inquiry within one business day.